A winter storm brought rain and a chance of thunderstorms to San Diego County Monday afternoon. 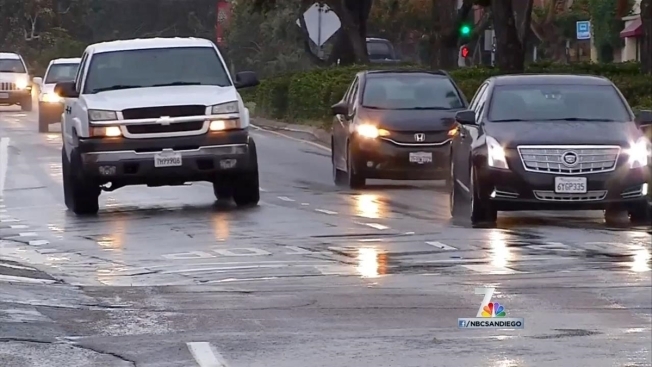 The rain began to fall in the North County before 4 p.m. NBC 7 Meteorologist Jodi Kodesh said there was a chance of a thunderstorm for some residents in the foothills and mountains of San Diego County. The National Weather Service has issued a small craft advisory for the San Diego coastline. Not only are strong winds expected to arrive with the cold front off the coast but they will be accompanied by a building northwest swell. This storm brings with it unusually cold temperatures. Orange, San Diego and inland counties saw temperatures in the 30s and low 40s with a freeze warning in effect for parts of Riverside and Imperial counties. Keep up to date on the changing weather conditions by downloading the free NBC 7 mobile app and selecting weather as the app's home page. To the north, California's citrus industry in the Central Valley dodged a hard freeze that was feared during recent cold nights. Area temperatures in the San Joaquin Valley dipped to the high 20s and low 30s, ideal for most types of citrus for short periods. As a precaution, some growers ran wind machines and flooded orchards, which raise temperatures a few degrees to protect trees during a hard freeze, according to the California Citrus Mutual, a trade association of growers.